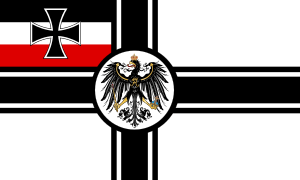 The German Empire ("Deutsches Reich" or "Deutsches Kaiserreich" in the German language) is the name for a group of German countries from January 18, 1871 to November 9, 1918. This is from the Unification of Germany when Wilhelm I of Prussia was made German Kaiser to when the third Emperor Wilhelm II was removed from power at the end of the First World War. It was once called the "Second Reich". 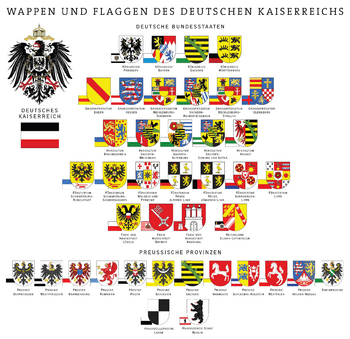 The name of Germany was "Deutsches Reich" until 1945. "Reich" can mean many things, empire, kingdom, state, "richness" or "wealth". 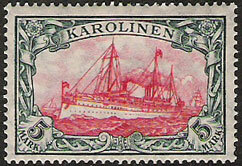 Most members of the Empire were previously members of the North German Confederation. At different times, there were three groups of smaller countries, each group was later called a "Reich" by some Germans. The first was the Holy Roman Empire. The second was the German Empire. The third was the Third Reich. The words "Second Reich" were used for the German Empire by Arthur Moeller van den Bruck, a nationalist writer in the 1920s. He was trying to make a link with the earlier Holy Roman Empire which had once been very strong. Germany had lost the war and was suffering big problems and he wanted to start a "Third Reich" to unite the country. These words were later used by the Nazis to make themselves appear stronger. German nationalism rapidly shifted from its liberal and democratic character in 1848, called Pan-Germanism, to Prussian prime minister Otto von Bismarck's pragmatic Realpolitik. 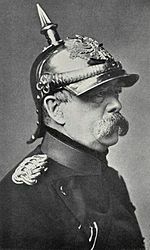 Bismarck sought to extend Hohenzollern hegemony throughout the German states; to do so meant unification of the German states and the exclusion of Prussia's main German rival, Austria, from the subsequent German empire. He envisioned a conservative, Prussian-dominated Germany. Three wars led to military successes and helped to persuade German people to do this: the Second war of Schleswig against Denmark in 1864, the Austro-Prussian War in 1866, and the Franco-Prussian War against France in 1870–71. Die Proklamation des Deutschen Kaiserreiches by Anton von Werner (1877), depicting the proclamation of Kaiser Wiilhelm (18 January 1871, Palace of Versailles). Left, on the podium (in black): Crown Prince Frederick (later Frederick III), his father Emperor Wilhelm I, and Frederick I of Baden, proposing a toast to the new emperor. Centre (in white): Otto von Bismarck, first Chancellor of Germany, Helmuth von Moltke the Elder, Prussian Chief of Staff. On 10 December 1870 the North German Confederation Reichstag renamed the Confederation the "German Empire" and gave the title of German Emperor to William I, the King of Prussia, as Bundespräsidium of the Confederation. 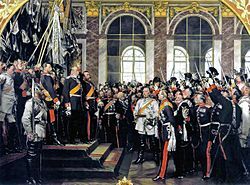 The new constitution (Constitution of the German Confederation) and the title Emperor came into effect on 1 January 1871. During the Siege of Paris on 18 January 1871, William accepted to be proclaimed Emperor in the Hall of Mirrors at the Palace of Versailles. Legislation also required the consent of the Bundesrat, the federal council of deputies from the 27 states. Executive power was vested in the emperor, or Kaiser, who was assisted by a chancellor responsible only to him. The emperor was given extensive powers by the constitution. He alone appointed and dismissed the chancellor (so in practice the emperor ruled the empire through the chancellor), was supreme commander-in-chief of the armed forces, and final arbiter of all foreign affairs, and could also disband the Reichstag to call for new elections. Officially, the chancellor was a one-man cabinet and was responsible for the conduct of all state affairs; in practice, the State Secretaries (bureaucratic top officials in charge of such fields as finance, war, foreign affairs, etc.) acted as unofficial portfolio ministers. The Reichstag had the power to pass, amend or reject bills and to initiate legislation. However, as mentioned above, in practice the real power was vested in the emperor, who exercised it through his chancellor. 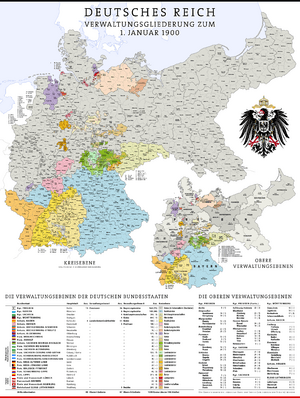 Although nominally a federal empire and league of equals, in practice the empire was dominated by the largest and most powerful state, Prussia. 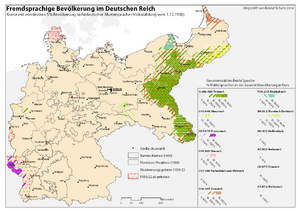 Prussia stretched across the northern two thirds of the new Reich and contained three-fifths of its population. The imperial crown was hereditary in the ruling house of Prussia, the House of Hohenzollern. With the exception of the years 1872–1873 and 1892–1894, the chancellor was always simultaneously the prime minister of Prussia. With 17 out of 58 votes in the Bundesrat, Berlin needed only a few votes from the smaller states to exercise effective control. Nazi Germany, or "Drittes Reich"
Tensions between Germany and the Catholic Church hierarchy are depicted in a chess game between Bismarck and Pope Pius IX.Between Berlin and Rome, Kladderadatsch, 1875. Wilhelm II, German Emperor.Oil painting by Max Koner, 1890. German Empire Facts for Kids. Kiddle Encyclopedia. This page was last modified on 15 April 2019, at 05:45.